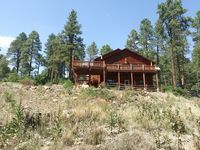 Property 12: Come Relax in the Beautiful Vallecito Valley. Property 15: Mountain Retreat! Vintage Creekside Cabin. Property 27: Great Views And Close To The Lake. Property 29: COME PLAY AT THE LAKE! ENJOY OUR COZY MOUNTAIN CABIN! Property 35: Secluded, rustic log house on three acres - dog-friendly & close to town!